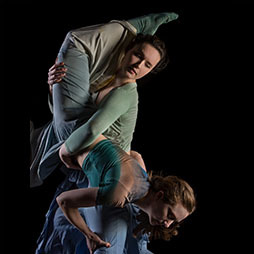 LucidBeings Dance premiers an original production, The Edge Effect, featuring choreography by Franki Graham and Jeanna Riscigno and sound score by composer Timothy Nohe. Inspired by the extraordinary biome created at the merging of two ecosystems, the dancers explore the potential for cooperation, support and sustainability possible when diverse communities are brought together as one. Join us as we dive into the ocean, play in the grasses of the prairie, experience the vastness of the tundra and swing through the branches of the rainforest. Discover the beauty that is possible at their intersection! LucidBeings Dance is a local contemporary dance company founded in 2017 under the direction of artists Franki Graham and Jeanna Riscigno. Described as “..straddling the line between sensible and visceral” (BMore Art, 2018) the company uses organic movement and intricate partnering to make work that is a catalyst for compassion, wonder, unity and change. The company has been presented as a part of multiple programs within the past two years, most notable including the Maryland Choreographers’ Showcase (2018), the Baltimore Dance Invitational (2018 and 2019), VelocityDC Dance Festival (2017) and the Richmond Dance Festival (2017 and 2018). UMBC is located about 10 minutes south of the Inner Harbor, just off I-95 and I-695. For this event, free visitor parking is available in Lot 8, directly adjacent to the Performing Arts and Humanities Building, where the Dance Cube is located on the third floor — please click here for additional information. For questions about acquiring tickets and general Box Office concerns, contact the dance box office by phone at 410-455-6765.